A dad and daughter pole dancing duo branded 'the weirdest thing I have ever seen' by a Britain's Got Talent judge have opened a studio together. 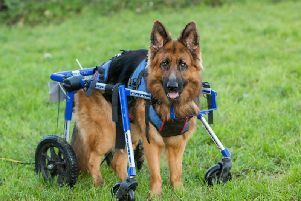 A dog left unable to walk after it was stamped on as a puppy is now on the move - thanks to its own set of wheels. 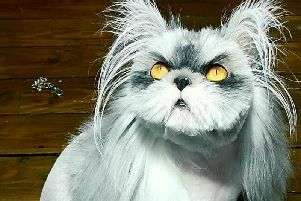 Meet the freakishly furry 'werewolf' cat that is constantly mistaken for a dog - due to a rare condition which means its whiskers never stop growing. WATCH: Would you put yoghurt on your Sunday roast? 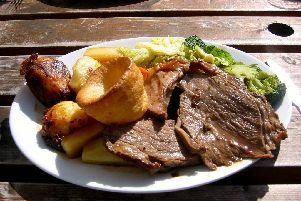 Move over gravy - Brits are enjoying ketchup, mayonnaise and even yoghurt with a roast, according to research. 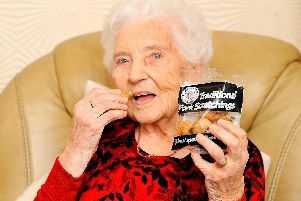 A great-gran who celebrated her 100th birthday says the key to a long life is a packet of pork scratchings a day. A young woman has told how she needs to sleep next to a freezer every night due to a rare incurable disease which leaves her in constant pain 24 hours a day. 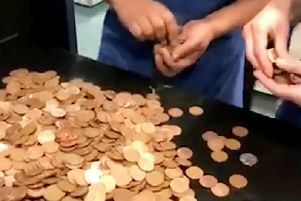 This is the bizarre moment a disgruntled customer paid £25 for a Domino's pizza meal - using just 2p coins. 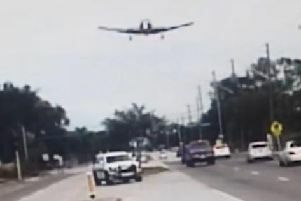 Dashcam footage shows the dramatic moment a light aircraft crashed down onto a main road in America. 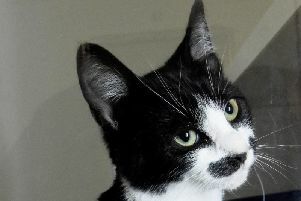 An abandoned kitten has been inundated with offers of a new home due to its uncanny resemblance to the ceelbrated detective Hercule Poirot. 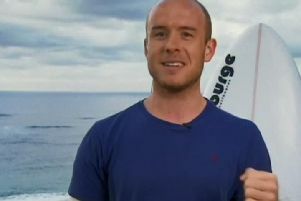 A British doctor has told how he punched a shark on the nose to escape its jaws while surfing off the Australian coast. 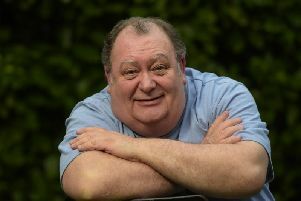 NATIONAL: I look like Bernard Manning - so was he my dad? A TV actor who is the spitting image of Bernard Manning says he is willing to take a DNA test to settle whether or not he is the late comedian's lovechild. 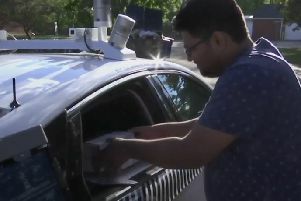 Domino’s and Ford teamed up to see if customers would warm to the idea of pizza delivered by driverless cars. WATCH: Makers of a new Nazi game censor Hitler for the German release - by removing his moustache! German gamers are in fits of giggles after makers of the new Wolfenstein game censored Hitler - by removing his moustache. 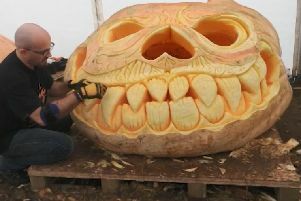 NATIONAL: Now that's what we call a Halloween pumpkin! It's claimed to be the world's biggest Jack O'Lantern. 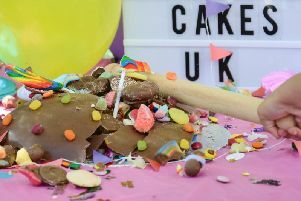 A mum and daughter have reinvented the birthday celebration - creating cakes designed to be smashed into bits. Going shopping when you're emotional is bad for your bank balance, according to research. 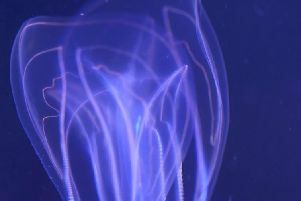 Alien-looking Ctenophore jellyfish have been introduced to Sea Life London. 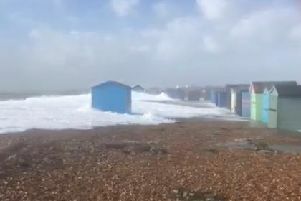 A video shows a beach hut being forced up the shoreline when it was hit by a powerful wave at Hayling Island.